Where Tyson Fury goes, controversy follows, and that was the case at the Europa Hotel in Belfast where the weigh-in was taking place ahead of fight night at Windsor Park on Saturday. The 30-year-old tipped the scales at a mammoth 258lbs ahead of his bout against Italian Franceso Pianeta, but Fury and Pianeta weren't the only heavyweights in the building. 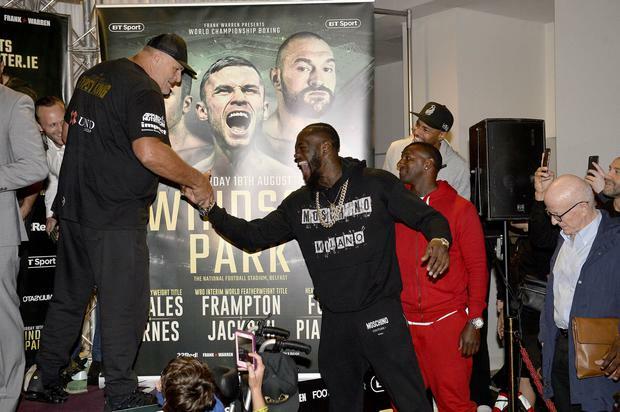 Deontay Wilder, the WBC heavyweight world champion, crashed the weigh-in to square up to his rival Fury. Alabama heavyweight Wilder posed for pictures with fans in the crowd, before shouting 'bomb squad', and squaring off with Tyson Fury's father John Fury. Wilder and Tyson Fury then came face-to-face in the lobby of the Europa Hotel, with dozens of fans holding them apart. 'Bomb Squad' is a catchphrase associated with Wilder, and is derived from his 'Bronze Bomber' nickname. Only a couple more hour UK and I’ll be officially in the building . Wild man Wilder is lit right now 🥂 w/tons of British Fan to enjoy! It's been rumoured a showdown in Vegas towards the end of the year could be on the cards. Carl Frampton may be feeling more like a warm-up act at his own show after that display, but he had a fairly uneventful morning in comparison, weighing in at 126lbs exactly.